Taylor is a world-renowned guitar brand with many famous people using the Taylor brand such as Taylor Swift, Dave Matthews, and Lindsey Buckingham. 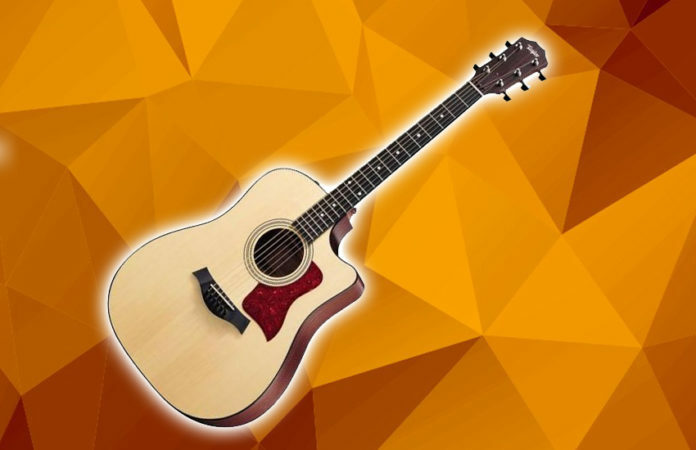 The Taylor 310CE Acoustic Electric Guitar is the lowest in the Taylor 300 series as an all-solid wood series and has been in production since 1998. I was luckily able to test out this amazing guitar and going to let you know why this was one of the best guitars I have felt and played in a while. 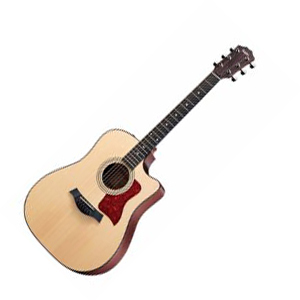 The Taylor 310CE is a typical dreadnought shape (a familiar shape to many guitarists) and is made with Sitka Spruce on the top with Sapele as the body wood. Although it isn’t flashy as an electric guitar, what it does bring is a beautiful and elegant look to it. It also comes with Italian Acrylic Small Diamonds fingerboard inlays and Indian Rosewood headstock overlay. There is then a satin finish with gloss top to offer protection form its environment. It also comes with a beautifully crafted Venetian Cutaway. What this material allows is a versatile playstyle with a dynamic range to produce beautiful, sounds with great tone and volume. Now it comes with an upgraded Expression System 2 which creates a natural sounding and accurate amplified sound. You are able to easily tweak your high and low-ends and will give you accurate feedback to get the perfect sound you need for your show. When you strum this guitar with your fingers, you can feel the grain of the wood (which feels really nice) and can instantly tell that there is definitely a rich bass and quality treble. Guitarists have reported that they rarely hear a buzz when they play with their Taylor series and is consistent no matter what shows they bring it on for. With its current pricing, it is still worth every penny to spend on this guitar as it has a well-rounded beautiful sound meant for shows. Although you can probably find a comparable guitar at a cheaper price if you look hard enough. However, there is brand recognition for Taylor and people will be impressed knowing you are a Taylor owner. I’d wholeheartedly recommend that you try out this beautiful piece of instrument to play. I’d say that this is geared towards more of a “high-end-beginner-guitar-player” meaning it is someone who has been playing the guitar for a couple of years and wants to upgrade their guitar. If you’ve been reading about guitars, you probably know that you can’t go wrong with a Taylor acoustic guitar no matter what. The only flaw is that it is quite expensive (partly because of the brand) and you can probably find a similar guitar for a cheaper price. But you will probably not regret purchasing this guitar.